The Vespa LX 125 Specs and Price - Vespa LX is an icon of a lifestyle that will make you the center of attention. By carrying out the legendary classic design with wrapped in attractive colors and a touch of chrome, increasingly ensuring the Vespa as Scooter is stylish and fashionable. Enjoy the ride comfort together with the Vespa LX 125. By design, the Vespa LX 125 has dimensions of length 1770 mm, width 705 mm and height of 1,280 mm with a 1,280 mm wheelbase. Vespa scooter that has an empty weight of up to 119 kg is equipped with a fuel tank capacity of 8.5 liters. 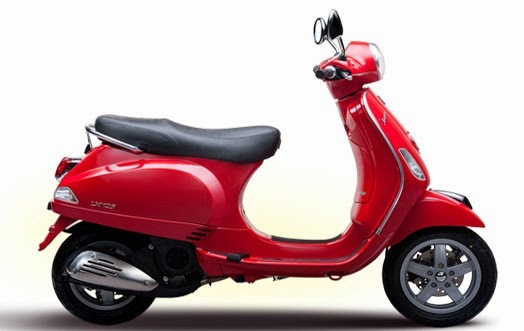 As for the sector of the legs, the Vespa LX 125 is equipped with single-arm front suspension with helical springs and shock absorbers single double-acting hydraulic juxtaposed with tubeless wheels wrapped in tires size 110/70 - 11 inches, whereas the rear sector carries a single suspension shock absorbers with four adjustable settings juxtaposed with wheels wrapped in tubeless tires sized 120/70 - 10 inch. the braking system, the LX 125 is equipped with front disc brakes and rear drum. For the engine, the Vespa LX 125 is equipped with an engine capacity of 124 cc, 4 stroke, single cylinder, two valves with a carburetor fuel intake system. From the engine, the Vespa LX 125 is able to catapult power up to 7.4 kW at 8250 rpm and a torque of 9.1 Nm at 7,250 rpm. Front Tire: Tubeless 110/70 - 11 "
Rear Tires: Tubeless 120/70 - 10 "
Thus the reviews regarding Vespa LX 125, all information about specifications, pricing or image Vespa LX 125 is summarized from the official website of Piaggio-Vespa Indonesia. Hope can be a reference for you to find out more details about specifications and price Vespa LX 125.